Welcome ZENITHmobile crusher theme site. 30 years-expertise, sets the standard for crusher industry. Now discover how ZENITHmobile crusher can help you! Mobile crusher is fully adaptable to all mobile crushing needs. It sets up a new range of business opportunities for contractors, quarry operators, recycling and mining applications. The mobile crusher machine can eliminate the obstacle of the crushing places and circumstances, and offer the high efficiency and low cost project plants for the client. To the client, it is the best choice. Mobile crusher plant consists of three types with mobile jaw crusher plant, mobile impact crusher plant and mobile cone crusher plant. Mobile crusher has high on-board chassis, short wheel base and tight turning radius, which is convenient for road transportation, especially for driving to crushing sites that are difficult to access. 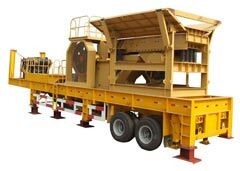 The set-up time of the mobile crusher plant are greatly reduced, compared with the stationary one. Mobile crusher crushes the material on site, without transporting the materials for off-site crushing, so the material transportation cost is greatly reduced. According to different customers- requirements, mobile crusher can be operated as independent units, or as two-stage crushing plant with primary and secondary crushing, or as three-stage crushing plant with primary, secondary, and tertiary crushing. Likewise, mobile crusher can be easily adjusted to suit the crushing application by choosing feeding to crusher or feeding to screen options. We can provide special mobile crusher plant based on customers- site, material, and particle shape requirements, etc. 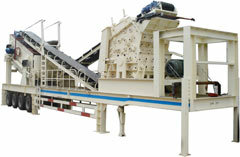 Such as self-load belt conveyor, multiple machines combined type, single machine type and so on. After choosing a good mobile crusher operating on-site location,the first work is to make the operating site flat.then run the mobile crusher to the right location,open lifting legs to erect mobile crusher. Trench excavation below the fixed legs. The size of pit is changed according to local soil, the more loose the soil is, the deeper and the larger the pit is.Then fix the activities outrigger to the fixed legs. Pour concrete into the pit. After solidification of concrete, adjust the concrete surface, so that support of mobile crusher is more stable. Finally retract lifting legs. In order to make support more stable,you can add sleepers or other auxiliary support tools.